Run Amok April 30, 2009 ? In 2004, Haicoole unveiled the California DeLorme Challenge cache. This popular challenge cache has since been repeated in many other states. Your Pennsylvania volunteer cache reviewers thought that we should join in the fun! This cache is owned jointly by Keystone, OReviewer, skeetsurfer, Mr. Ollivander, and our special emeritus reviewer, MissPlaced. The DeLorme Atlas & Gazetteer is published for all 50 states. These maps are a favorite among travelers and outdoors enthusiasts, and are available at many locations, including online directly from DeLorme. The goal of this cache is simple: to find a cache on each and every page of the Pennsylvania State DeLorme Atlas & Gazetteer. The image above shows the geographical extents of each of the pages of the Pennsylvania DeLorme Atlas & Gazetteer. The final cache coordinates can be obtained by successfully finding a cache on each page of the Atlas. As mentioned above, the posted coordinates are not the actual coordinates for the cache. The physical cache may actually be quite some distance from these coordinates! It was hidden sometime in the summer of 2006 by one of the volunteer cache reviewers. The terrain rating and attributes apply to the final cache location, and more details will be provided when you become eligible to seek the final cache. We guarantee you that it will be a strenuous hike. Early finders report hiking for 5 or 6 hours to find the cache and return to their car. If you have concerns about your physical ability to complete this hike, please contact us with details and we will provide hints on the relative difficulty of the different approach routes. We would like for any geocacher to be able to complete the Challenge! Generally accepted rules, guidelines and conditions for logging a cache find apply. These must be bona fide caches listed on Geocaching.com that you have personally (physically) found and logged. You may include caches found prior to the creation of the Pennsylvania DeLorme Challenge so long as they meet all other Challenge requirements. Since the Challenge is a lot of work, we wanted to reward finders with some good swag. The initial cache contents are listed in a note below. All the original items were new, and have retail prices ranging from $5.00 to $25.00. Please "trade up, trade even or don't trade," so that every finder of the cache will have an opportunity to trade for a quality momento of their experience. And, please take only one geocoin per finder. Rule added 5/13/07: If you have found or are working on the Pennsylvania All Counties Challenge, you may not use any of the same caches to qualify for the DeLorme Challenge. You must have at least one other reported find in a Map Grid in addition to the one you claimed to meet the requirements for the All Counties Challenge. 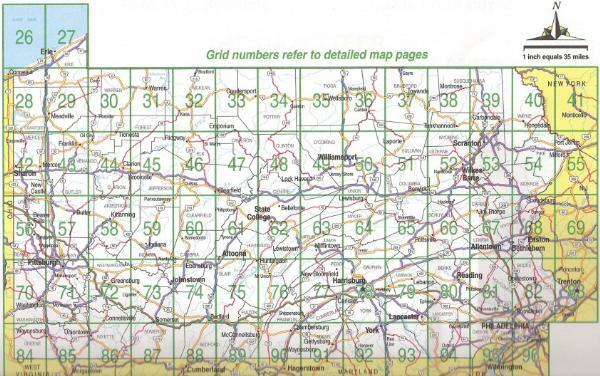 And, if you've completed the Pennsylvania All Counties Challenge, you cannot use that cache to fulfill the requirement for the Grid where the random posted coordinates are located! For Pennsylvania DeLorme Atlas pages that include space not located in Pennsylvania, only caches in the Pennsylvania portion count. We will go off of the posted coordinates for a cache (including multicaches and puzzles) when determining in which state or page a given cache falls. While the various editions and versions of the DeLorme Atlas do not seem to have changed much in terms of page boundaries, the image above derived from the information in the cache owner's copy (2001 Edition) will be considered definitive. The final cache is located on Pennsylvania State Gamelands. (Gee, *that* narrows it way down, doesn't it?) Like all cache hunts in State Gamelands, all applicable rules and regulations should be followed. This includes wearing at least 250 square inches of blaze orange on the head and body during the prime November-December hunting season. If a Pennsylvania Volunteer Cache Reviewer chooses to complete the Challenge under their personal account, he or she must return to the cache location and sign the logbook after meeting the same eligibility rules that apply to everyone else. When in doubt, ask — we can discuss it or even seek guidance from others, but the final decision rests with the cache owners. Many thanks go out to Haicoole for the original idea for this cache and to the owners of other DeLorme Challenge caches, especially Moun10Bike's Washington version, from which we have borrowed liberally. To help you figure out which caches are on which map pages, we have the following files available. Many thanks to IV Warrior and the Central Pennsylvania Geocachers group for hosting these files! 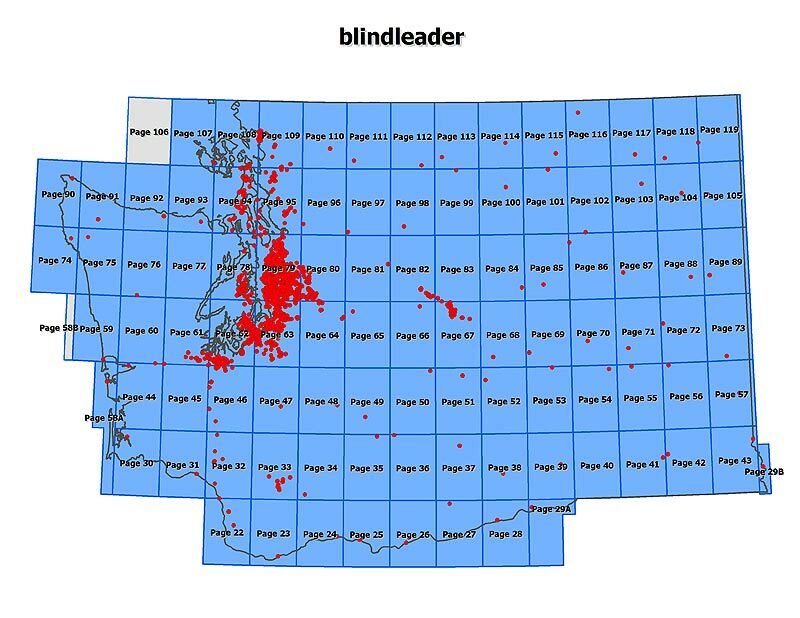 There is also an image of the Pennsylvania DeLorme overview map showing the map pages with the bounding latitudes and longitudes for the pages, excluding latitudinal and longitudinal boundaries created by state boundaries, shown in this log Log with image of bounding lats and longs. A challenge checker for The Pennsylvania DeLorme Challenge is available from Project-GC.com. This checker meets the updated (May 25, 2016) guidelines for challenge checkers for new challenge caches. It provides a list of qualifying finds (1find per page) and also a map showing which pages have been completed and which still need a qualifying find. This challenge checker is what PA Reviewers will be using to confirm that a cacher has met The Pennsylvania DeLorme Challenge. We also ask that you think of the *best* cache that you found on each page of the Atlas, for inclusion on your DeLorme Challenge bookmark list. That way, everyone will see how hard you worked to complete the challenge, and we will have a very nice compiled list of Pennsylvania's best caches. This is just a suggestion, not a requirement. If the only cache you found on an Atlas page is a micro at a highway rest stop, it's still eligible. Speaking of bookmark lists, if you are looking for excellent caches to complete a page for the DeLorme Challenge, check out a shared bookmark list such as Pennsylvania's Favorite Caches, or the personal "favorite caches" bookmark list owned by a geocacher in the area you are visiting.